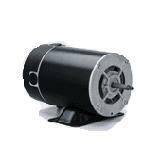 The Hayward Power Flo swimming pool pump can be found installed on may above ground swimming pools. 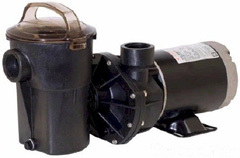 Although the Hayward Power-Flo pump is rated as one of the top of the line above ground swimming pool pumps they still will need to be repaired as time goes on. 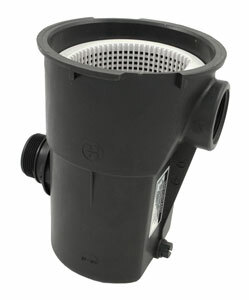 Hayward Pool Products offers a full line of replacement parts for all of the Power-Flo models. There are three different models of the Hayward Power Flo above ground swimming pool pump. The three models are the Power Flo Standard, The Power Flo LX and the Power Flo II. 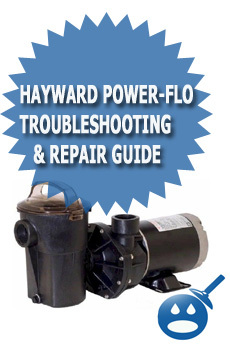 Even though the models are different and some options will vary between all three of the Hayward Power Flo pumps, the basic repair of this style pump will be the same. For example if you need to change the motor bearings because the pump is noisy or if you have to change the pump seal because it is leaking the repair would be the same for all three of the models listed above. Some differences between the power flo models are options such as different horse powered motors, built in swimming pool timers and off course Hayward has made these pool pumps more energy efficient over the years as well. 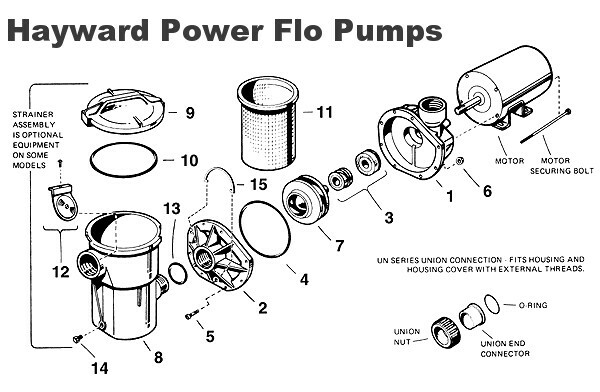 So if you are having any issues with your power flo LX, II or older model you can use our Hayward repair and troubleshooting guide below to help you get your pool pump up and running again in no time. The Hayward Power-Flo pump comes in many different models and depending which one you have will determine how it will turn on. Some of the power flo’s have timers on the back of the motors. If this is the case you will want to look for the manual on / off switch to manually turn the pump on or off. There also will be two-timer pins that you can set to make the pump turn on and off with the timer. 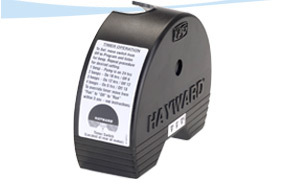 If your Hayward Power Flo does not have an automatic timer on the backside of the motor then you could just have a single toggle switch that will be located on the bottom of the back plastic housing. If you look on the bottom of the back motor housing there will be a switch that you can push from one side to the other. There also will be small print that says power on or off if you have a power flo with this option. Not all Hayward Power Flo pumps will have this either. The last option is that your power flow pump could be directly wired into your pool electrical system and you will have to look for the pool timer box to turn in on. You usually will not have this situation and will have one of the two mentioned above. If you notice some water leaking from the motor shaft of your pump you might need to replace the mechanical pump seal. The Pump seal is located between the impeller and the seal housing. You can buy a replacement Hayward Power Flo Pump Seal from many swimming pool stores or even a pump and motor repair shop. To install the new pump seal you will first need to remove the pump volute. After you remove the volute you can remove the bolts that are located on the flange on the front of the wet end of the power flo(see diagram below). Once you remove the flange you will have access to the Hayward Power Flo impeller. You will not want to unscrew the impeller from the motor shaft. The next step will be to remove the motor through bolts that connect the pump seal housing to the motor frame. Using a nut driver or small wrench remove the four motor through bolts and your pump seal housing will disconnect. Now that the pump seal housing is disconnect you will be able to remove the ceramic base of the pump seal from the housing. Once you remove that ceramic seal seat you will want to replace it with the new one. The last part of the seal will be located on the pump impeller. There will be a spring on the impeller shaft with a ceramic disk on the end of the spring. You will want to slide this off of the impeller and replace with the new pump seal spring you have. 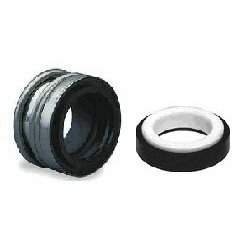 Once you place this part of the pump seal onto the impeller you can screw your impeller back onto the pump shaft and re-assemble the entire Hayward Power Flo Pump. The Hayward Power Flo pump is generally used in above ground swimming pool filter systems were the skimmer is installed higher then the pump. This will provide gravity feed of water to the pump but what can happen is something called swimming pool pump hydro lock. Hydro lock happens when a pocket of air gets caught between the pump and the skimmer. The pump will then try to prime but will not be able to because of the air locked pump. The way to unlock the air from the Hayward Power Flo and prime it correctly is to first make sure that the swimming pool is filled to mid skimmer. Once the pool is filled to that level you will want to open the top pf the pump slightly, just enough so air can wisp out of it and once you start to get water you can close the pump lid. Your pump is now primed and ready to start. 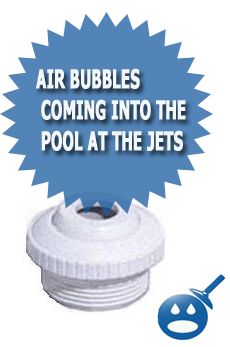 Always stick around for a few minutes and watch the return jets in the pool to make sure the pump has reached full prime. If your power flo pump is not flowing the water enough your pump strainer basket could be full of debris or possibly clogged. 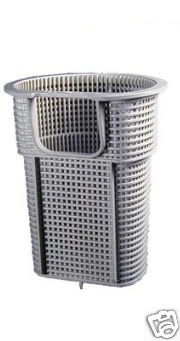 You will need to open the pump and remove the Hayward Power Flo pump strainer basket and empty and clean it. The way you can do this is to grab the handle on top of the pump lid. The cover / lid on the power flo will be clear. You will need to turn the cover about 90 degrees until the cover un-locks from the grooves. If you look at the side of the pump housing you will be able to see the notch and grooves that the cover of the pump housing locks into. Once you have the cover removed you will want to pull out the pump strainer basket and clean it thoroughly with a garden hose making sure it is free of all debris. If you leave any loose debris inside of the pump basket it could get stuck in the impeller and clog it. This will cause your pump not to run right. Also, If you have any cracks in your pump strainer basket you will want to replace it as soon as possible before the loose debris that are traveling through the cracks in the basket destroy the impeller. After a long winter or sometimes when you don’t use the pool motor for an extended amount of time and with the right moisture conditions the armature of the motor can form surface rust and cause the motor to “freeze up”. Now, this isn’t the temperature kind of freeze, its more like a “humming sound” that will be coming from your Hayward power flo motor. You will usually hear this humming or jamming sound when you first plug in the pump, if in fact the motor is seized or jammed. 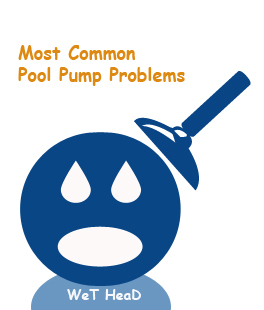 Sometimes the frozen up pool pump motor will cause the circuit breaker to also blow. Most of the time people think that they will have to replace the Hayward Power Flo Pump at this point but you actually can try a small repair technique that sometimes will un-freeze your humming motor. What you will want to do is to get a rubber mallet or small hammer and tap the motor casing all around. This will “free up” the surface rust enough so that next time you plug it in the motor will be able to spin. If you have tapped the motor a few times and the pump still does not start you will want to have the pump looked at by a service shop to see if the motor can be replaced or you could just buy a new motor for the pump. This method will not make every Hayward Power Flo pump that is frozen up work again but it will work for some pumps. You also could tap the pump a tad harder or if you are handy could take the pump apart and look into the rebuilding of it. Solution: Your pump may have something called “hydro-lock”. If this is the case you will need to release the air from the filter system. Solution: When the pump hums it could mean that you have some surface rust that has built up on the motor. Try tapping the motor forcefully a few times to “free up” the motor armature. Solution: You will need to remove the volute and the pump housing cover and will have to clean the eye of the impeller out. Solution: You may not have an on or off switch on your power flo, some models just had the pigtail cord that would just get plugged into the wall or the timer. We have a hayward missle pump that is about 5 years old. I can’t seem to get the timer to work properly. I set it just like the directions and as I always have. I set it to beep 3 times to be on for 12 hours and off for 12 hours. It never kicks off after the 12 hours are up. Is there a way to reset and then start all over? We appreciate you leaving us a comment and we try to respond to every single comment but sometimes there are so many comments on one article that something called ÃƒÂ¢Ã¢â€šÂ¬Ã…â€œÃƒÂ¢Ã¢â€šÂ¬Ã¢â€žÂ¢cross talkingÃƒÂ¢Ã¢â€šÂ¬Ã‚Â starts to happen and things can get confusing for everyone. You could specifically ask us and other members a direct question or help on a troubleshooting topic. This is a family owned website and topics & language should remain safe for everyone. Once you register you can post on the WeT Head Media Forums and get the answers to your questions in no time. We look forward in helping you solve your Plumbing, Heating, Swimming Pool or Pump Issue. I am trying to clean the strainer busket in my hayward pump,I turned the pump off, closed main port, all valves leading to the pump,but water is still gushing from the pump.What should I do? Thank you . My wife accidently left the pump on all night. I went out the next morning and turned it off, but now it will not start when you turn it on??? Any suggestions? Does the Motor still run? Let me know, I am not sure if you just “lost the prime” or if the motor is fried. If this is an in ground swimming pool let me know and we can go form there. Whenever we turn on our pump, the pump blows sand into the pool. What causes this and how can i fix it? Our fairly new (approx 2 year old) hayward EC50AC DE filter leaks through the top.Ãƒâ€šÃ‚Â Actually it gushes out water after running for a little while, after pressure builds up or after vacuming. My husband took it apart, cleaned the gasket and dirt that was visible and it still does this.Ãƒâ€šÃ‚Â What can we do short of buying another pump or dismantling the pool? 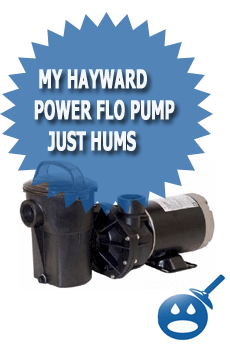 My hayward Power Flo pump just hums when I turn it on. Was running fine less then 24 hours ago. Any suggestions? If tapping the pump motor a few times does not get the pump to go, let me know and I can suggest something else. I had the same problem with the pump working last night and now not working and just humming. Tried the tapping on the motor casing with no luck. Any other suggestions??? ?